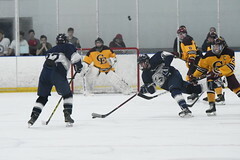 The Clippers battled to a 1-1 tie with St. Dom’s to pick up a few valuable Heal Points in their race for a playoff spot. 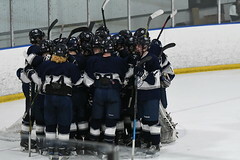 St. Dom’s came into the game as one of the top-ranked Class A teams and was fresh off a 6-2 win over Greely. However, stellar goaltending by Charles Henry Watson ’22 and good team defense managed to limit the Saints’ offense. 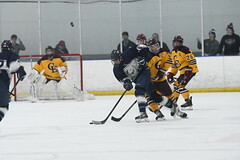 Yarmouth scored first when Will Giese ’20 took advantage of an errant pass and fired the puck past the St. Dom’s netminder who was out of position. Kurt Heywood ’19 and Matt Robichaud ’22 were credited with assists. However, less than two minutes later, St. Dom’s tied the game on a power play goal and the first period ending with the teams locked 1-1. Both teams had offensive opportunities in the final periods, including sudden-death overtime, but the Clippers were not able to find the go-ahead goal and Watson made several big saves to preserve the tie.